Shimizu Seifu was a "professor of toys", he painted a lot of the traditional Japanese toys and woodblocks were made of them. In 1906 he curated the first known exhibition of Japanese folk toys. founded the "Hobbyhorse Club " dedicated to "the merry and nostalgic enjoyment of children's toys". 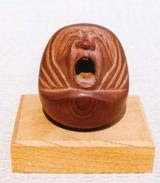 Seifu, who was an artist, a wealthy trader and a student of Japanese folklore, assembled a large collection of children's toys and published a series of books cataloging his collection. Nishizawa Tekiho 西澤笛畝（1889 - 1965). A rare and fascinating work of ethnographic and artistic importance on Japanese folk toys, the first comprehensive illustrated work on the subject, and a source of inspiration for the Mingei movement. Offered are 3 consecutive volumes, the first printing of volumes 2-4, published in 1911, complete with 139 superb color woodblock prints, 8 full-sheet (double-page) and 131 full-page, the color woodblock printing finely executed, some prints with silver or gold, all in sharp impressions with fresh bright colors. The 10 volumes set was published between 1891 and 1923. A labor of love, Unai no tomo remains the definitive, illustrated work on Japanese folk toys and is the most important illustrated work on the subject since Edo nishiki (1773). It has since served as a source of inspiration for artists, including Munakata Shiko and a benchmark and reference for ethnographers, anthropologists, historians, and collectors. Pate calls it, "the classic work" and Kyburz, "the bible for all serious toy amateurs". Head of a wealthy Tokyo trading company, artist, calligrapher, and the leading Meiji period collector of omocha (toys), including the varieties of ningyo (dolls). Takeuma-kai (Hobbyhorse Club) for advancing the enjoyment and study of the many forms of traditional Japanese folk toys and in 1906 curated the first known exhibition of Japanese folk toys in Japan, the Kodomo Hakurankai (Children's Exhibition): many of the items were from his collection. 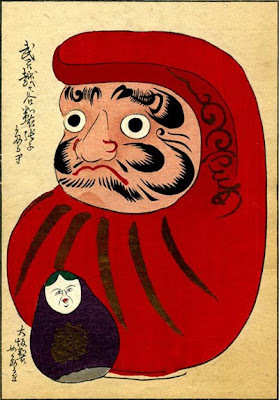 In 1909 he founded the influential Odomokai 十八番クラブ (Adult's or Connoisseur's Club) that greatly advanced the appreciation of these symbols of Japanese culture, handmade from common materials and usually sold on ennichi or link-days, many originally derived from amulets and talismans rooted in Shinto and traditional Japanese folklore.
. . . CLICK here for Photos from DONGAN COLLECTION !